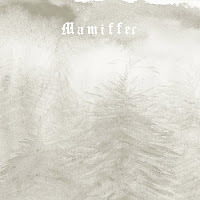 Like an adamant darkening mist, Mamiffer’s Hirror Enniffer is a skulking presence that persists in its sense of despair only to evolve into distant calm right at the point when all hope appears lost. Mamiffer is Faith Coloccia, a Seattle-based pianist, and a collective of song-weavers and visionaries. Under the watchful eye of Coloccia and her trusty tape recorder, friends Aaron Turner from Isis and Chris Common from These Arms Are Snakes have gathered to compile an environmental scourge of noise and atmosphere that is elegant, striking, and evocative. Hirror Enniffer is Mamiffer’s debut and it breathes with all of the artistic sensibility one would expect from a musical visionary like Coloccia. Her sense of sound, her sense of feeling through sound, is exhibited in profound ways that intensify the experience with portions of classical, noise, and atmospheric rock. At times, the air feels close. Hirror Enniffer comes like a dream, like an unrelenting vision that persists in deepening the tunnel until the bottom is all but forgotten. The tones are lush and somewhat damp, offering a glistening haze that carries through all six hypnotic tracks. What really matters for Coloccia and Co. is the mood and the insistence of the passage of time. Chords hold and fade, easing through new notes perhaps by accident (“Death Shawl”) while still providing a clear direction. Other moments cascade like overlapping dreams, coating the listener in an episodic drama (“Black Running Water”) that subsides only when the full story is told. Mamiffer’s Hirror Enniffer is dream music. It is the soundtrack in one’s head that winds through scenes of open fields, through hands on blades of grass, through moonlit mysteries. It is also the last stop as the dream passes from glorious cheerfulness to disastrous nightmare. The eeriness is pitiless and the alluring tide of darkness is often interminable like an endless hall filled with locked red doors (“Suckling a Dead Litter”). Music like this cannot merely be described; music like this must be felt. in my top five of 2008!